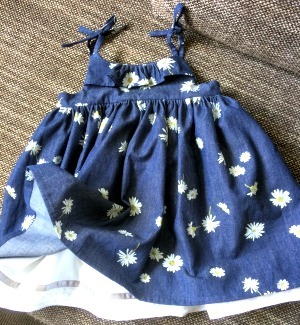 I came across this stunning 3 month dress pattern when searching for a pattern to make my wee granddaughter some summer dresses. 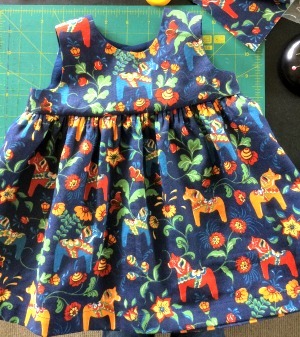 Sew Jereli offers a great tutorial using this pattern & a link to "Made by Rae' for the free 3 month dress pattern called 'Little Geranium Dress'. 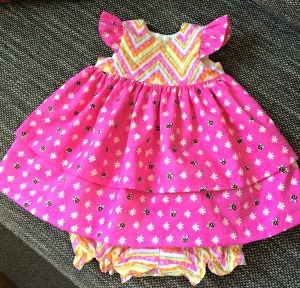 I love making wee dresses - they are so easy and super cute. No need to worry about the fit as babies look gorgeous in everything!! I wish it was that easy for me when I go shopping for clothes for myself. 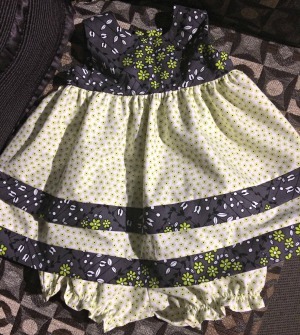 You will find that a lot of people have used her free pattern and made lots of very cute dresses that are scattered all over the internet especially Pinterest. 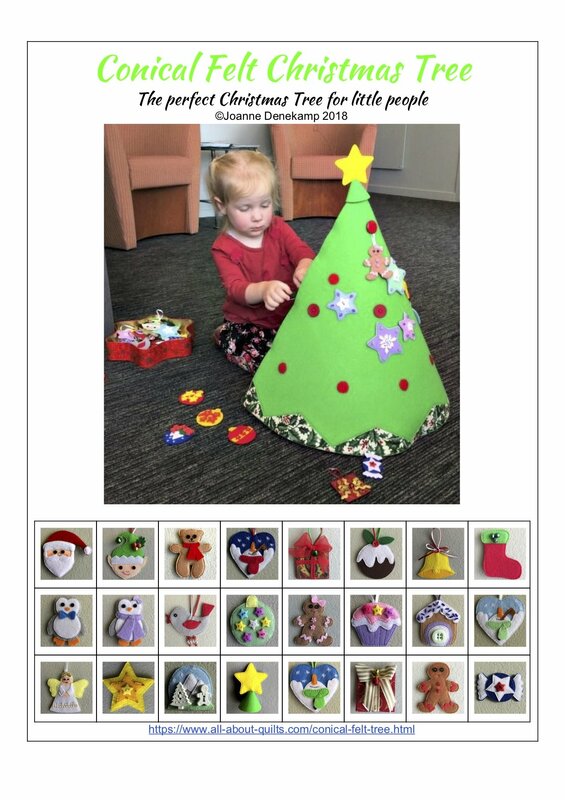 She also sells her pattern which includes 9 different sizes and many variations all for only $10! 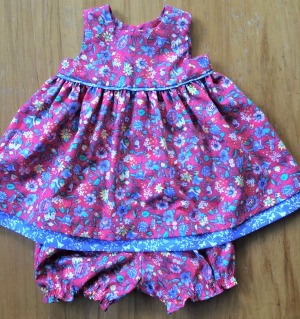 The bloomers were also a free pattern/tutorial that I found from 'This Mama makes Stuff'. With a little bit of pattern tweaking I enlarged the bodice pattern to make more dresses for my granddaughter - now 5 months old. 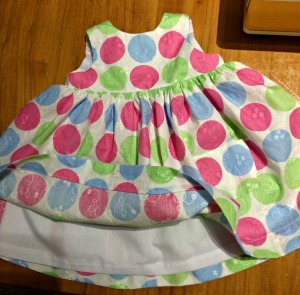 My daughter gave me a wee dress she bought to use as a pattern. I think she was wanting a completely different type of dress! Anyway this is easy to do. I traced around the bodice pieces and then added the seam allowance. The skirt just required 2 measurements and that's all. 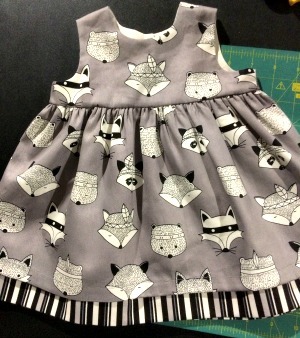 Below is the wee dress sewn this way. 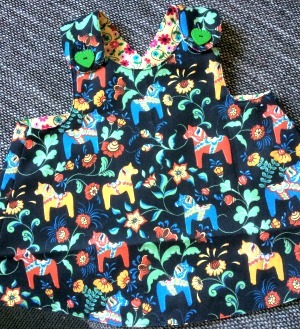 Another cute and simple dress to make is this cross over pinafore, shown below. I was amazed at how simple this dress was to make. 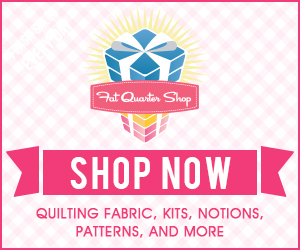 The pattern & tutorial can be found at Smashed Peas and Carrots. I love that the dress is reversible which adds versatility and extra warmth if needed. 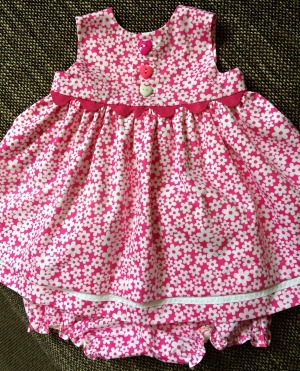 My daughter likes the length of this wee dress as it is crawling friendly!